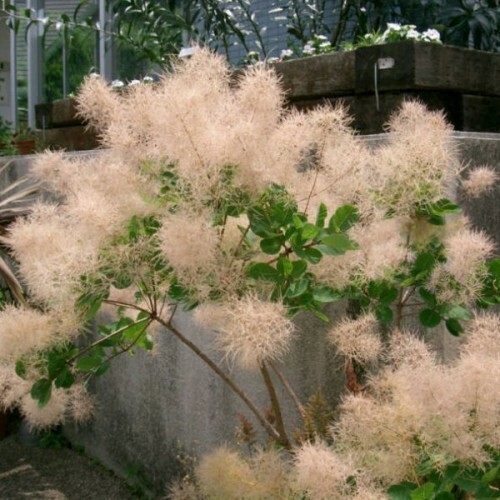 At its showiest, few shrubs are as pretty and effusive as the common smokebush. Its small flowers produce puffy ivory, pink or purple clouds of smoky fruits that persist for a couple of weeks before dissipating. 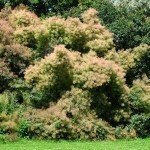 It does not become too large and may be multi-trunked and shrubby or single-trunked and tree-like. Originating from southern Europe to eastern China, it naturally exists along hillside forests and mountain thickets. With age, most specimens will develop rounded, open crowns. 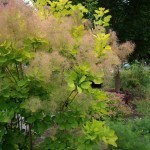 The rounded, medium blue-green leaves of common smokebush are attractive, distinctive and turn shades of yellow, orange and red in fall. 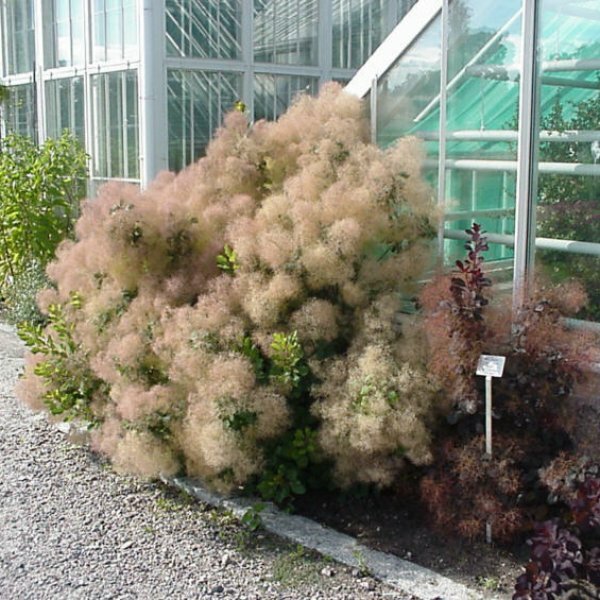 Some cultivars even sport showstopping gold, purple or burgundy foliage throughout the growing season. In summer, large panicles of inconspicuous flowers appear followed by long, curled, densely-packed, hair-like fruits that look like large puffs of smoke. These are highly ornamental and may be ivory, dusty green, pink, dusty rose or purple. Common smokebush prefers sites with full sun to partial shade and moderately fertile to rocky, poor well-drained soil. It is quite slow growing, and has strong limbs that resist breaking, so pruning is rarely required. Pests and disease problems are few but it may succumb to leaf spots—particularly in humid, moist weather. Occasionally, leaf rollers are a problem. Pour boiling water over seed, let stand in water for 12 hours; or small numbers of seed, file or sand through the outer seedcoat, let stand in water for 12 hours. Seeds need 30 days pre-chill preiod. Seeds can be stratified in dampened peat or sand, in a plastic box or bag at +4C or +5C in a refrigerator. The seeds should not be frozen or in a wet medium. GERMINATION after stratification: Sow seed 1/8 inch deep , tamp the soil, keep moist, mulch the seed bed.